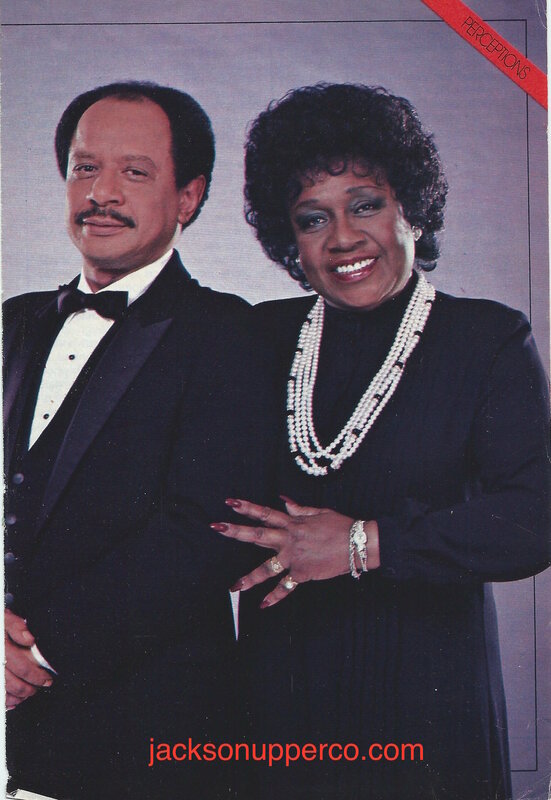 isabel sanford | THAT'S ENTERTAINMENT! Welcome to a new Sitcom Tuesday! Today we’re concluding our coverage on the best episodes from The Jeffersons (1975-1985, CBS), the longest running spin-off from Norman Lear’s flagship series, All In The Family (1971-1979, CBS). I am happy to announce that the entire series has finally been released on DVD. Dry cleaning mogul George Jefferson and his wife Louise continue to adjust to life in a posh — and almost exclusively white — high rise on the Upper East Side of Manhattan. 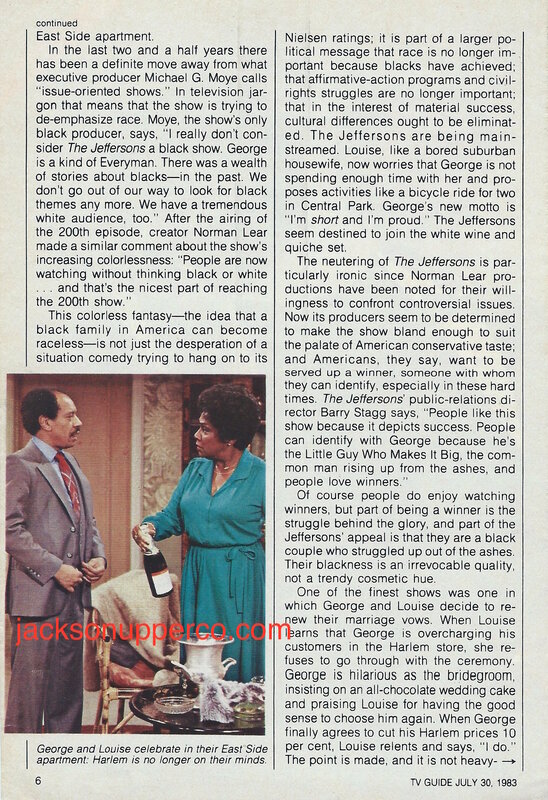 The Jeffersons stars SHERMAN HEMSLEY as George Jefferson, ISABEL SANFORD as Louise “Wheezy” Jefferson, ROXIE ROKER as Helen Willis, FRANKLIN COVER as Tom Willis, PAUL BENEDICT as Harry Bentley, and MARLA GIBBS as Florence Johnston. Unfortunately, The Jeffersons didn’t know when to call it quits. It’s a ’70s show trying to survive in the ’80s. The series changed itself to adjust to the times, and lost itself in the process. Like last season, this year is a total disappointment. Louise Jefferson is an alogical lunatic, and the other characters have been milked for all their comedic worth. The show is tired. And although I think this year is no worse than the last (in fact, the selections in today’s post may be collectively funnier than the shows highlighted last week), I could only pick six episodes that I think exemplify this season’s strongest installments. (Again, while there’s only six, they may be more worth your time than last week’s seven.) For new fans, this list will give you a place to start. For seasoned fans, there might be a few surprises. Here are my picks for the six best episodes of Season Eleven. (They are in AIRING ORDER.) Note that every episode this season is directed by Oz Scott, unless otherwise noted. Louise and Florence conspire to prank George on national television. George panics when he forgets Louise’s birthday. Like last season, the final year suffers from not giving enough meaty material to its star. This offering is one of the few that puts Sherman Hemsley’s George at the center of the proceedings, where laughs are almost guaranteed to exist. The entry is also appealing due to its simple premise — of George trying to scrounge up a birthday present for Louise — necessitating that the beats of the story, and all of the ensuing comedy, must come from the character. A lot of cute, and more importantly, amusing moments in this quiet(er) gem. George drops a home run ball hit by Reggie Jackson. Our special guest star show of the season features Reggie Jackson and several of his fellow Angels. As not too much of a sports fan, I am unmoved by the incorporation of the celebrities; rather, I’m delighted by the delicious premise about George getting ridiculed by the entire world after dropping a home run ball hit by Reggie Jackson. Great stuff to explore there. Unfortunately, the second half treats us to unfortunate loony Louise, who sneaks into the locker room via the laundry cart (à la Lucy) and engages in really cheap laughs. George and Tom try to set a record of most rides in an elevator. George and Tom, whose friendship didn’t really develop until after they became grandparents and the show consciously shed its socially charged ambitions, form the center of this script, which sees them trying to break a world record. The one they settle on: highest number of times up and down the elevator. This isn’t a hilarious offering, but it’s satisfyingly written. Furthermore, the premise harkens back to the evergreen theme of George really wanting to leave behind a legacy. This is just another extension of that interesting trait. Louise believes she’s painted a masterpiece — but nobody else agrees. Episodes that acknowledge Louise’s delusions are definitely more enjoyable, because this self-awareness is like a breath of fresh air. And indeed, there are a lot of really big and memorable laughs in this entry, especially from Florence, the only character who refuses to spare Lousie’s feelings and lie about her artistic ability. While I think the show would be funnier in the era in which Louise wasn’t always so clueless, for the quality of the script itself and the other strong character moments therein, this one is a veritable winner. Florence and Harry Bentley go out on a date. My pick for the strongest episode of the season, this installment was produced early in the year but held back after a preemption. The offering is notable for being one of the few with a story about Harry Bentley that’s actually made one of these lists. (Because, honestly, he didn’t fit into a lot of the stories, and the ones he got often didn’t work.) The beauty of this episode is the dynamic between Florence and Bentley, and the awkward strain that potential romance puts on their interaction. The subtitled date scene is a riot, and in addition to the enjoyable comedy, it’s welcome to see an offering that’s so dependent on characters and their relationships. Again: simplicity. 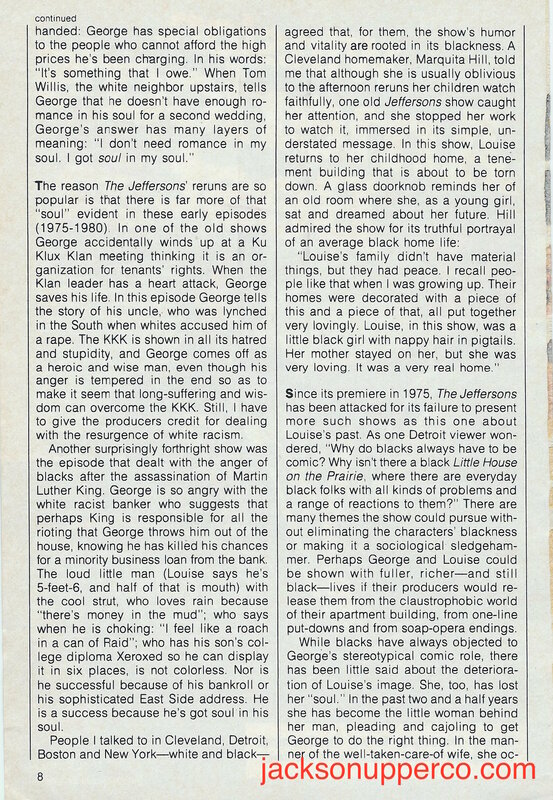 Other notable episodes that narrowly missed the list above include: “Blood And Money,” in which George pays Ralph to donate blood in his name and then tries to reap the benefits when that blood goes into Mrs. Whittendale (this one almost made today’s list), and “The Gang’s All Here,” in which Louise takes over Charlie’s bar on the evening in which two rival biker gangs patron the place. *** The MVE Award for the Best Episode from Season Eleven of The Jeffersons goes to…..
Come back next Tuesday for the best from the first season of Cheers! And tune in tomorrow for a new Wildcard Wednesday post!